L to R Brian Scott, Dave Harvey, Dana Senge, Carmen Bria, Catalina Hernandez, Anne Gunnison, and Yoonji Lee. Still working: Karen Zukor, Hays Shoop, and Camilla Van Vooren. Tuesday August 18 was a very productive day. 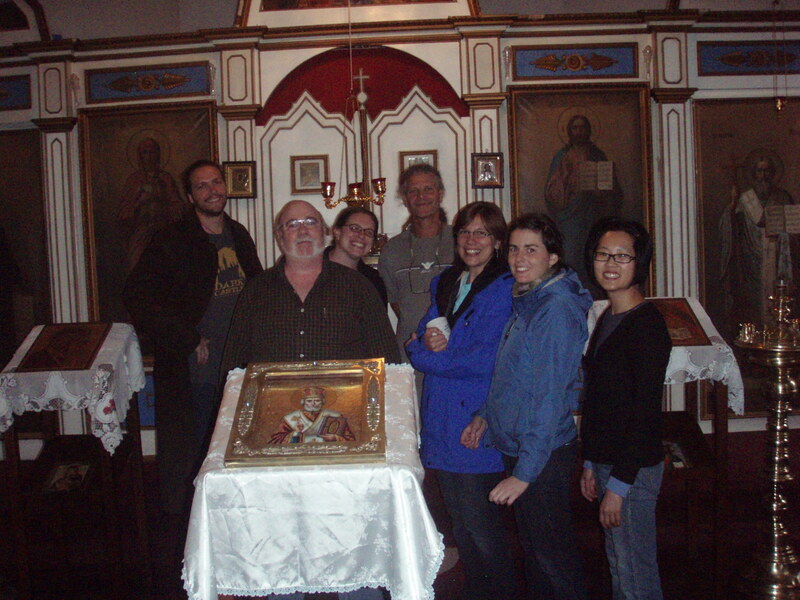 The “Angels” project for this year’s Western Association for Art Conservation conference (WAAC) continued at the St. Nicholas Russian Orthodox Church in Juneau, Alaska. The three teams hit the ground running in the morning: brass, textiles, and paintings. The paintings folks wrapped up with their condition assessments and treatment recommendations for the large icon paintings, and volunteered to try their hand with the metals. 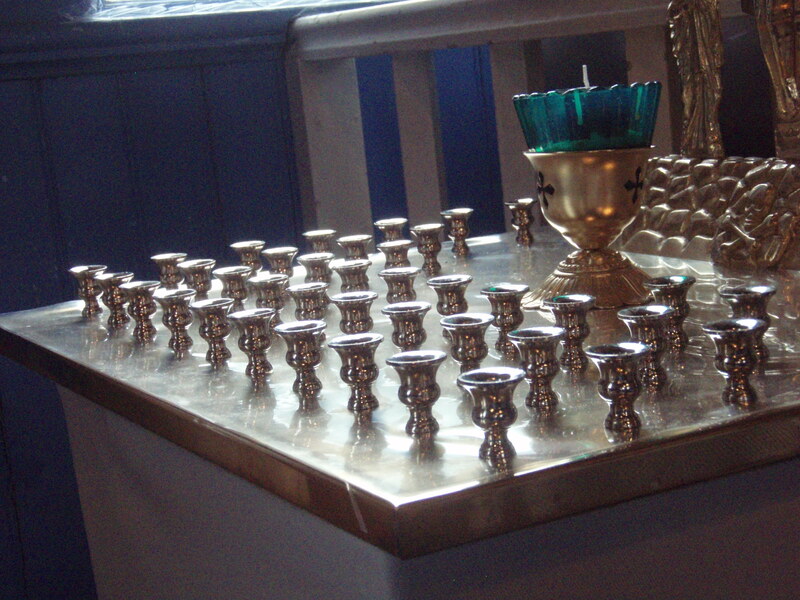 This table for memorial votive candles was a special challenge. 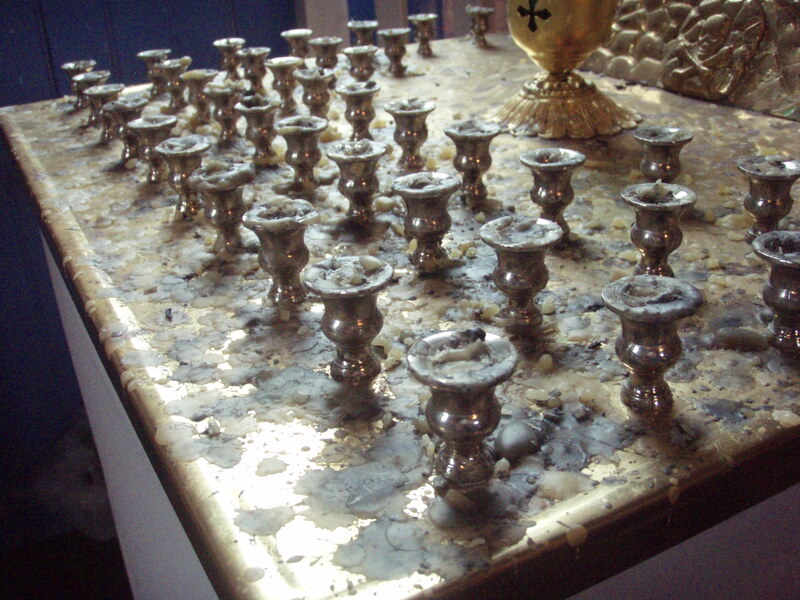 Once Dave saw that the item was sheet brass over a wooden tabletop, the plan to soak it in hot water with a little surfactant to loosen the wax (as we had done with the disassembled candleabra) was “off the table” as an option. I hit four stores yesterday afternoon in search of a steam gun to combat the wax. No luck. Last night Dave told me, “I don’t think we can take on that little votive table, that’s a major project and we aren’t even done with one candleabra yet.” Caretaker James Johnson had been hearing complaints for weeks about the unsightly appearance, but had valiantly held out against pressure to polish it himself, “Wait till the conservators get here…” he’d been telling people. 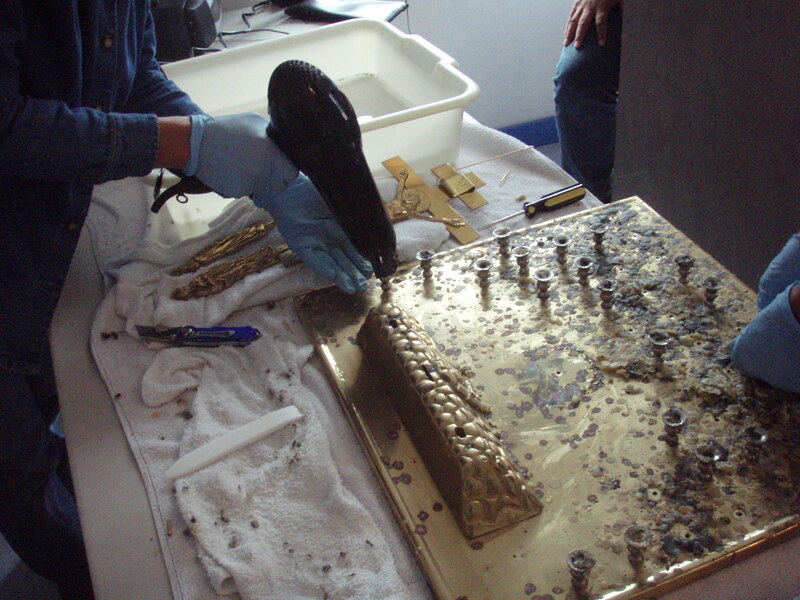 He knew full well how much work it is to polish these pieces, as he’d been the person doing it for years. But still, we didn’t want to disappoint him and leave it all waxy. When the paintings team announced they had wrapped up their work and were available to join the metals team, the well-caffeinated crew decided to go for it. The wax gave way with gentle heat from a hair dryer and much effort with teflon tools. Michael Penn came and took photos for the Juneau Empire newspaper. Layers of clear polyester Mylar film were stacked and pierced to make a nearly invisible barrier to catch the dripping wax. Once things get unsightly again, the top layer of Mylar could be removed for an improved appearance. Many of the screws holding the little candle cups were stripped, and I spent several hours driving around town gathering M4-25 .70 machine screws. Need metric machine screws? Automotive hardware stores are the best bet. 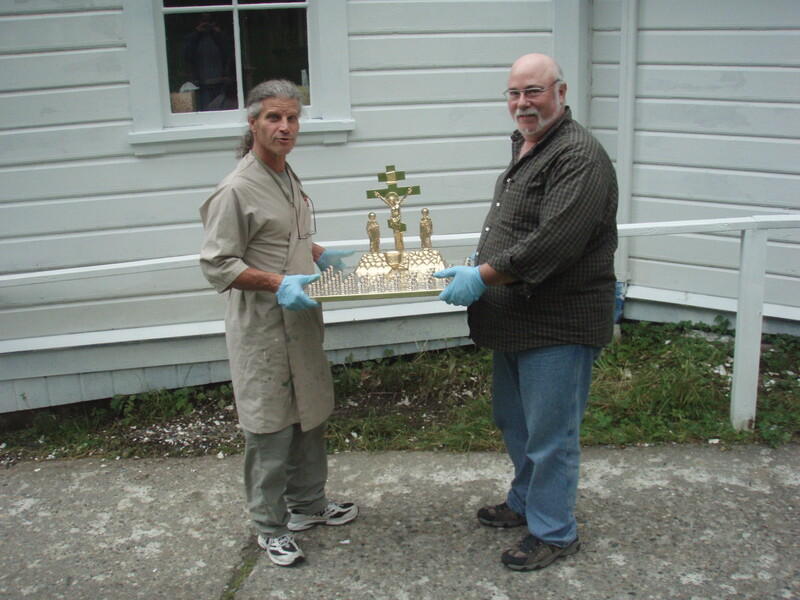 When Carmen and Dave carried the polished artifact back into the church at the end of the day, we were giddy indeed. 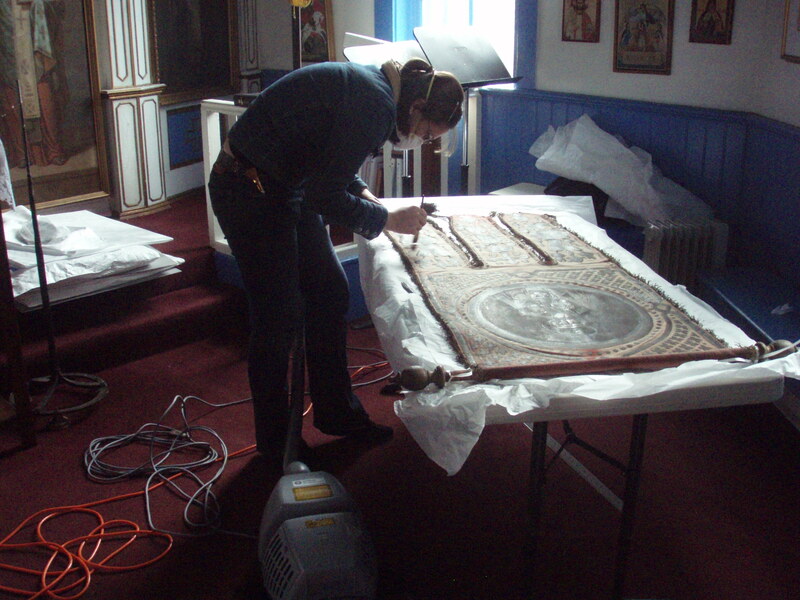 In the meantime, Catalina Hernandez and Yoonji Lee were vacuuming historic liturgical banners from the church while Dana Senge was back in my lab with the sewing machine making Tyvek pillows and strapping mechanisms to store the two old and two newer liturgical banners. The intention was to put them in boxes, but the attached hanging rods and rigid painted surfaces (oil on leather adhered to textile) set requirements for the folded size, and there was a need to get them through doorways. They would either be stored up a twisty stairwell, or across the courtyard in another building, exposed to rain during transport. Several large sheets of corrugated plastic Coroplast had been procured, but not a single cut had been made by lunchtime. 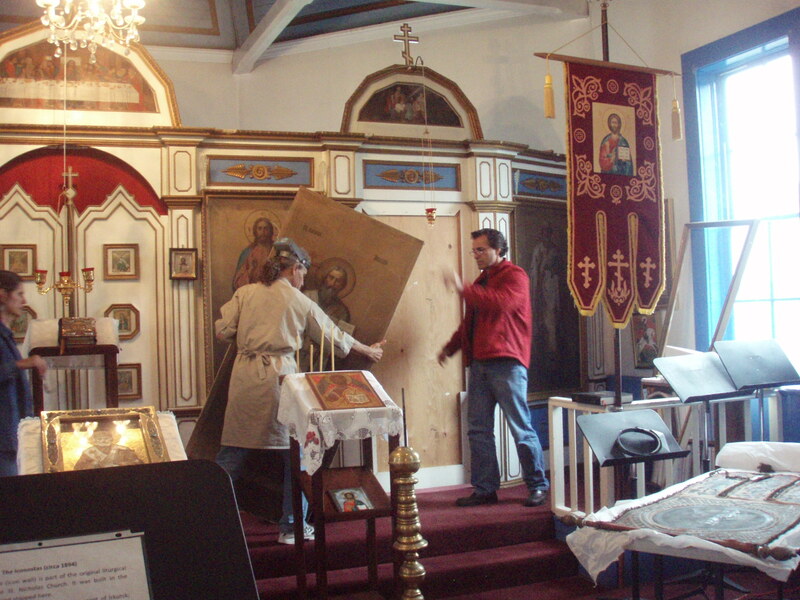 Amazingly, by the time the polished brass was being carried in to the church, the textile boxes had been completed and the old banners were safely in storage along with the box for the new banners, which were still on display in the church. 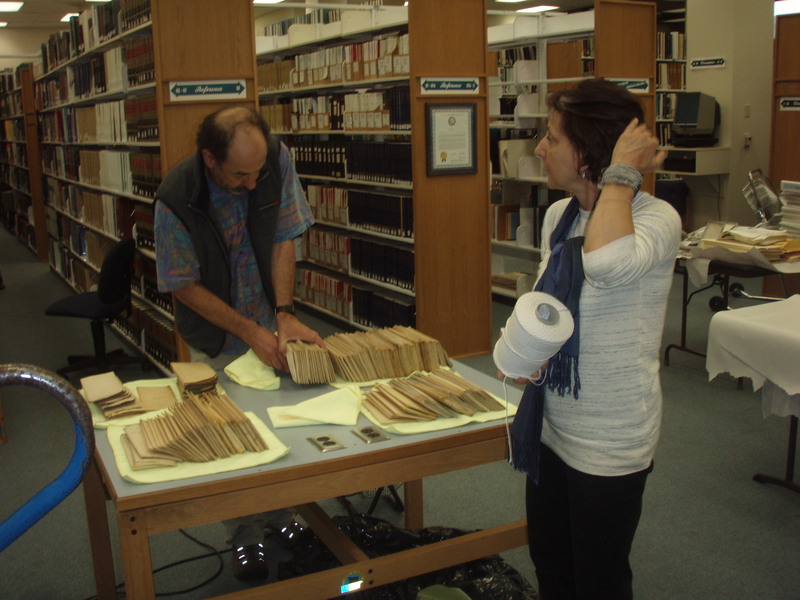 During all this activity, paper conservator Karen Zukor, who had intended to be at the church, was still up top her eyeballs with wet documents from the disaster at the Alaska State Archives. Karen joined us for a quick swig of iced tea at the Pizzaria Roma at lunchtime, then dashed back into the thick of things. In the afternoon, Hays Shoop and Camilla Van Vooren also headed down to help. In the evening, the whole gang converged on the Carrlee house for wine and cheese and a little “HAPPY BIRTHDAY” happy hour for Karen. What a way to celebrate your birthday…helping direct a disaster recovery! 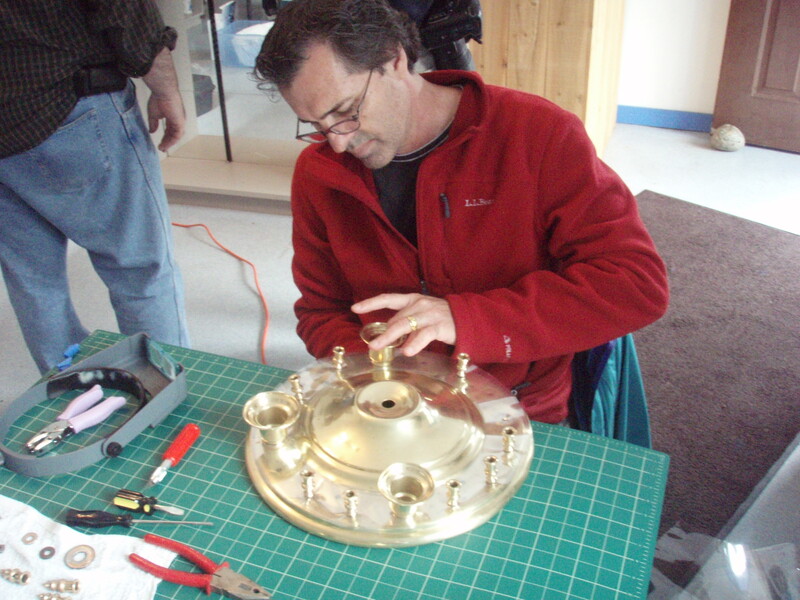 The Western Association for Art Conservation is having their annual conference in Juneau, and the volunteer “angels” have their hands especially full this year. 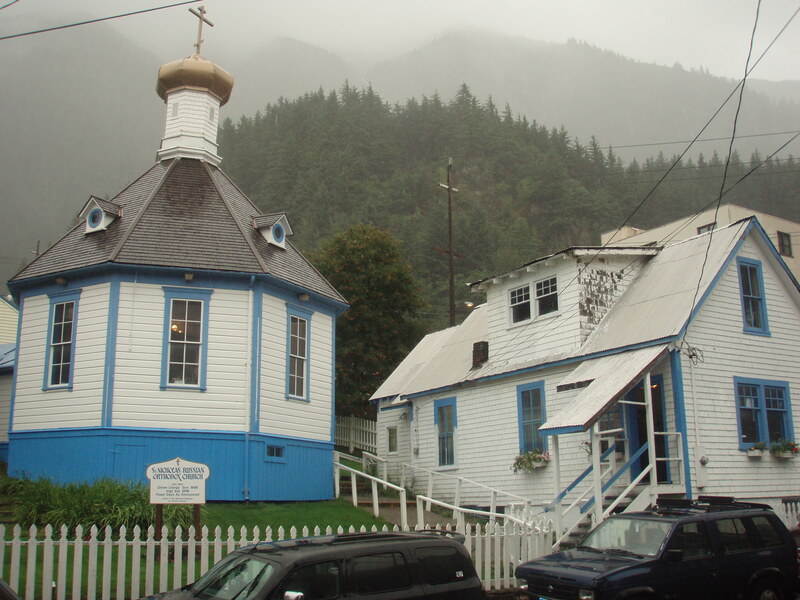 The site is the St. Nicholas Russian Orthodox Church in Juneau, an 1894 gem on the National Historic Register. The church was originally built by Alaska Native Tlingit people who continue to be most of the membership. The architectural plans and many of the liturgical artifacts were gifts from the church in Russia 115 years ago and continue to be used today. 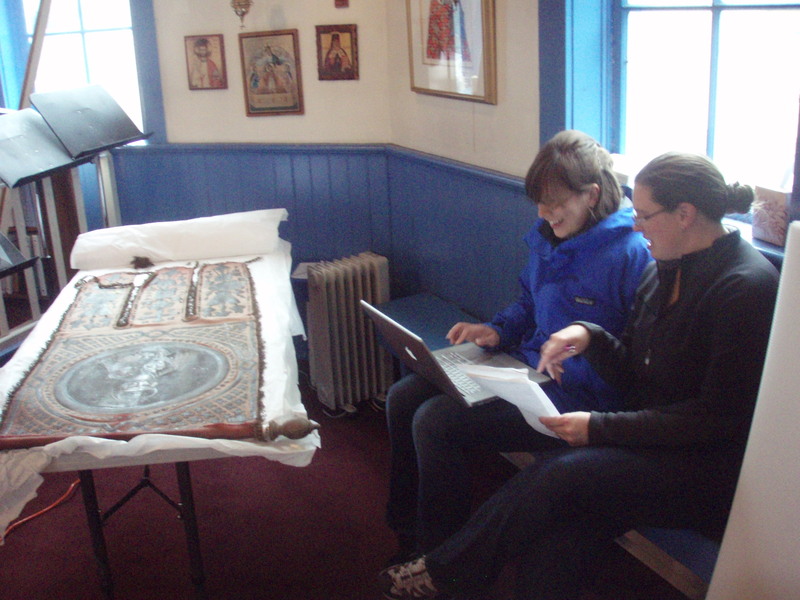 The Angels “paintings team” includes (L to R) Camilla Van Vooren, Carmen Bria, and Hays Shoop from the Western Center for the Conservation of Fine Art. WAAC president Scott Carrlee was supposed to be the administrator of this busy gang, but the weather had other plans. A major storm hit Juneau over the weekend, and the rain hasn’t let up much for days. Flood warnings are in effect for parts of town, and the 670-passenger cruise ship “Pacific Princess” skipped its port of call in Juneau because of high winds and fears it could not hold anchor. 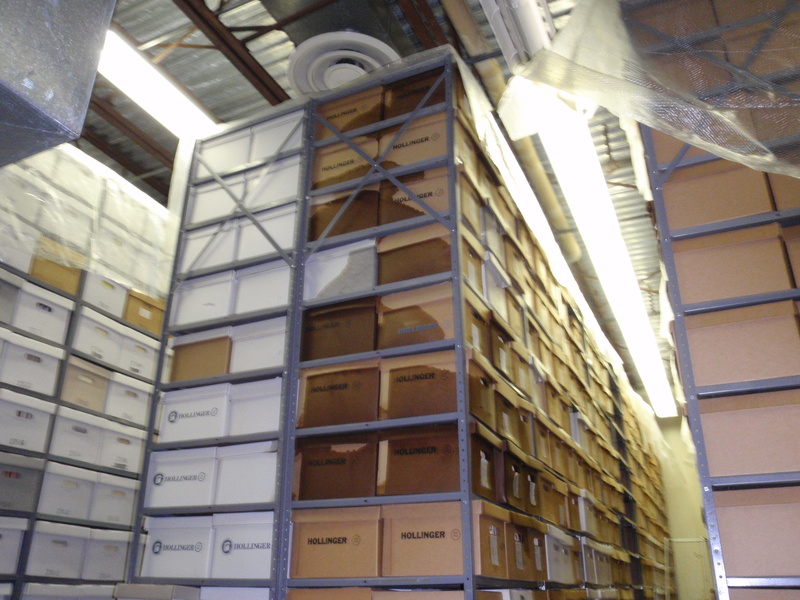 Last night, a plastic “bubble” protecting ongoing construction work on the roof of the Alaska State Archives blew off, and rain caused serious water damage to some 500 boxes of documents, including maps, court documents, legislative documents and governors’ records. Scott headed over to the Archives with several Angels, including Karen Zukor (paper conservator in private practice) Yoonji Lee and Anne Gunnison. 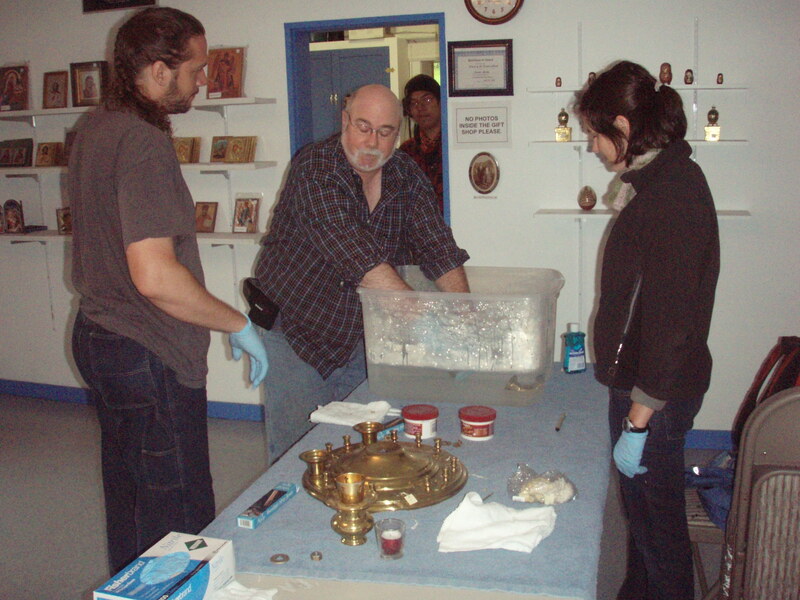 Janice Schopfer (head of paper conservation at LACMA) Albrecht Gumlich (Getty Conservation Center objects conservator) and Christel Pesme (paper conservator and GCI consultant) happened to be in town for the conference and also pitched in with disaster recovery efforts. 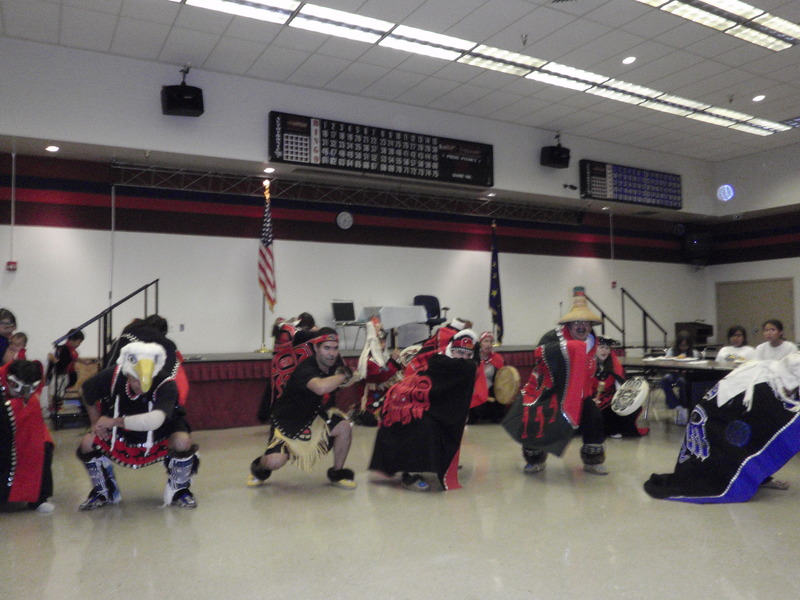 Members of the parish arranged a banquet dinner for us this evening at the Alaska Native Brotherhood/Sisterhood Hall. We were stunned and delighted by what they presented. Salmon pasta salad, meat n cheese plates, veggie plates, garden salad…but that was the tip of the iceberg! Fresh salmon and halibut, and I daresay some of the best I have ever had… James Johnson knows what to do with fish! Delicious fry bread and rice rounded out the meal. And then there was a cake with the image of the church on it, celebrating 115 years. 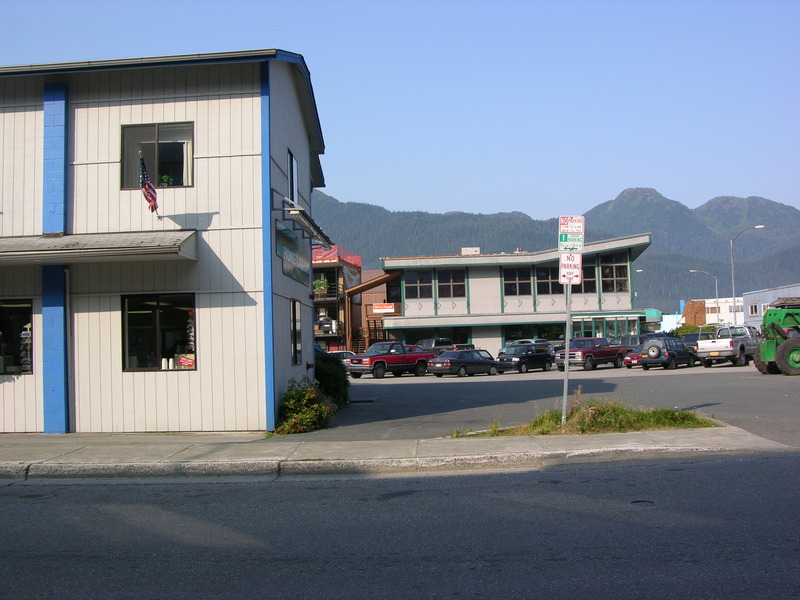 Coming to Juneau for the 2009 WAAC conference? Here’s what to expect! PACKING Juneau is a very casual place. People wearing heels or ties are generally expected to be from somewhere else. Bring comfortable walking shoes…everything on that WAAC map is walkable. A light raincoat or a fleece jacket would cover you in most rainforest-y weather, but we have had an unusually sunny summer so far. Maybe that will continue? GETTING HERE If you arrive by airplane, the airport is about 20 minutes ride from downtown. Taxi is under $25 with tip. The ferry is quite a distance, more than a half an hour, and the taxi is around $40. I’ll look into the bus angle, but generally that’s not been the most straightforward. Ferry travelers can be pretty friendly and you might be able to talk someone into giveing you a ride into town. USEFUL HERE You can probably get cell reception…there is AT&T and GCI here, and visiting family and tourists with iPhones seem to do OK. The JACC (Juneau Arts and Culture Center, where the conference is taking place) has free wi-fi. If you rent a car, parking downtown is a pain. Find a good spot and walk. But if you want to see the sights, having a car gets you access to some great stuff. Don’t want to walk uphill? Cut through the State Office Building when it is open! The Willoughby Avenue entrance has elevators that take you to the 8th floor. Cut across the building through the atrium (organ concert noon on Friday) and exit onto Calhoun Avenue, right across from the City Museum. 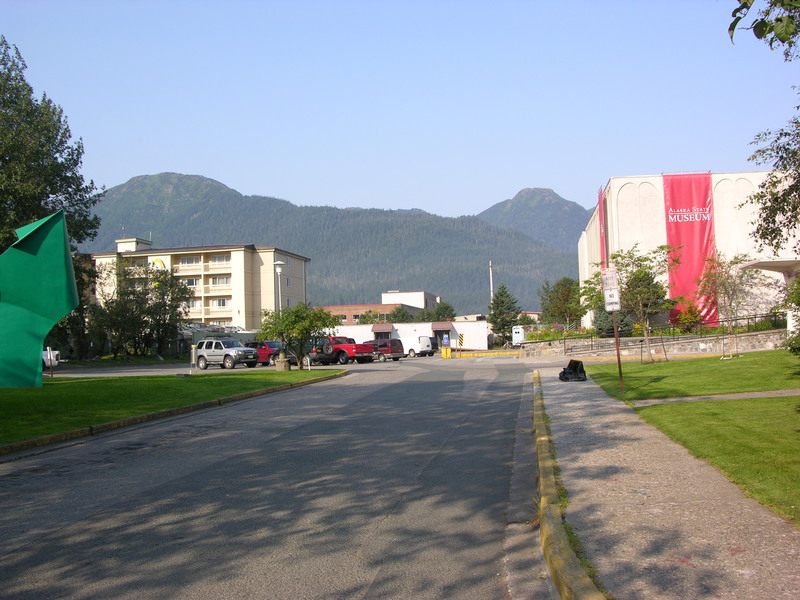 Here’s the Juneau Arts and Culture Center, where the conference is taking place. It is the building with the artist tents out front on the corner. You can register here on the 20th, or at the opening reception at the Alaska State Museum the night before. On the right side of the photo, on the street, is the Goldbelt Hotel. The big building in the background is the State Office Building. This view is just outside the JACC building. 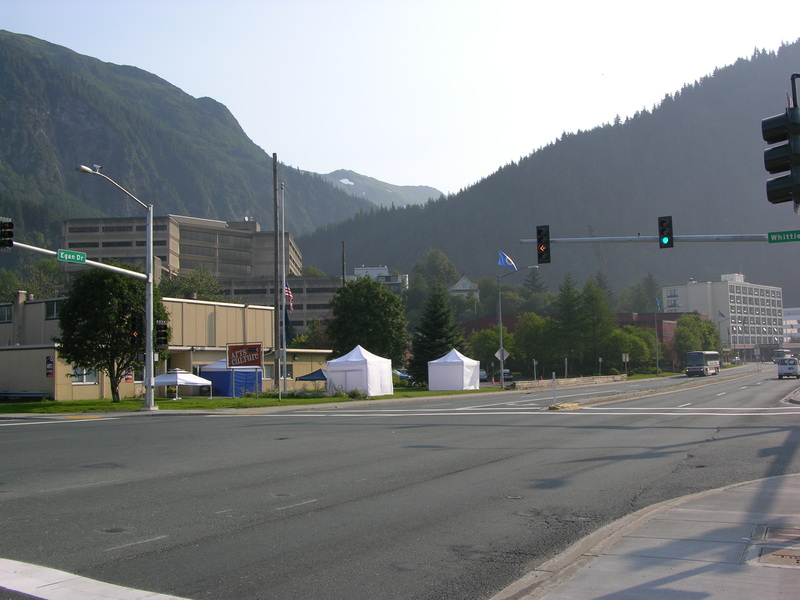 Alaska State Museum on the right, and the Prospector Hotel on the left. The Driftwood Hotel is out of view on the other side of the Museum. Along the edge of the Prospector at the back of the parking lot there is a little gravel shortcut to the grocery store and drugstore beyond. EATING HERE Juneau is not known for its spectacular restaurants. There are plenty of places to get a decent bite, though. BREAKFAST at the Sandpiper Cafe (next to the Driftwood Hotel) is the best in town, but the City Cafe in the Baranof Hotel is perfectly fine. TJ McGuires in the Prospector Hotel is OK too. Breakfast sandwiches can be had at Thibodeau’s and the Alaskan and Proud grocery store. Silverbow Bakery has coffee and bagels, and Heritage Coffee has breakfast pastries, I think. I noted locations of better-quality coffee on that map with little smiley faces. No Starbuck’s or Pete’s I’m afraid, but the local roast, Heritage Coffee, is decent. LUNCH places I frequent include those breakfast places above, Kenny’s Wok and Teriyaki, Subway, and my favorite, the Hangar on the Wharf. That’s in the big blue building on the waterfront called the Merchant’s Wharf. There is a new restaurant under construction down there, too, and they have a temporary trailer serving various dishes emphasizing seafood. There is outdoor seating only, but let me tell you, this is the best food for the money in all of Juneau right now. Also in the blue building are tasty little russian dumplings at Pel Meni’s. Open late, and that’s all they serve. On front street there’s a place called Bernadette’s Fast Food and it has killer Filipino style fare. Up near the Capitol is a health food store called Rainbow that has lunch food too. After lunch, treat yourself to homemade baked goods or fancy Mexican cocoa-coffee type drinks at Pie In The Sky. DINNER Fanciest places are Zephyr (Mediterranean) and the Gold Room in the Baranof Hotel (seafood and steak joint.) Tarantino’s is a decent Italian restuarant. El Sombrero has good Mexican unless you are very familiar with Mexican and then it won’t be satisfying. Midwesterners like me think it’s just fine. Kenny’s Wok and Teriyaki and Seong’s Sushi bar are OK. Bullwinkle’s Pizza is a dive-y local joint good for a pitcher of beer and a garlic chicken pizza. Pizzaria Roma down in the Merchant’s Wharf is the place for more specialty pizza heavy on the garlic. And if you have a car (or willing to pay the taxi fare) our favorite dinner place is the Island Pub across the bridge on Douglas Island. Thin crust brick oven very creative great view of the channel. Pretty much locals-only. Good bar and nice ambience too. These are about a block from the JACC. Building in foreground is Thibodeau’s Market, a little place to get a 75 cent cup of coffee and a sandwich or inexpensive breakfast burrito. In the background, Sandpiper Cafe! Good breakfast and lunch. The Driftwood Hotel wraps around the parking lot back there in an “L” shape. FUN HERE I’ll start with the downtown walkable stuff. If you like to hike, for goodness sake head up Basin Road (the oldest road in Alaska) and hike up Perseverance Trail. If you start downtown and hike to the end and back downtown, that’s probably a good half a day. Take some water and a snack. The Last Chance Mining Museum is partway there, and an even shorter hike would be the Gold Creek Flume loop only an hour or two and mostly flat after a steep initial hill to get there. There are at least 100 fabulous trails in the Juneau area thanks to the gold mining history here. Let me know if you need directions. People get lost and die every year. The Mount Roberts Tram is fun, but $27 per person. If you hike up Mt Roberts (takes about an hour, trailhead at the top of Sixth Street) you can ride down for free if you buy something worth $5 in the shop or resturant (a cold beer, for example!) The Juneau-Douglas City Museum and the Alaska State Museum are both swell, but of course you’ll get to see those at various receptions. Walking up and down South Franklin Street will make you feel like a tourist. But get beyond the flat part of downtown and you’ll quickly hit the residential neighborhoods of closely packed funky old houses that are sometimes compared to San Francisco neighborhoods. If you have a car…on Douglas Island are the remains of a whole gold mining ghost town called Treadwell, now swallowed up by the woods. The trail for it begins right on Sandy Beach in Douglas. Walking tour brochure available at the City Museum. A couple of miles down Egan Drive is the DIPAC salmon hatchery which also has a small aquarium. Last I was there, it was only $3. The Mendenhall Glacier is around 20 minutes drive from downtown Juneau. Has a great visitor’s center too. If you are willing to drive a bit “out the road” you can see the beautiful Shrine of St. Therese and the Jenson Arboretum. We often see sea lions and seals out there. With time and money, there are some outrageous adventures to be had. Adventure Bound boat trip is great to see a glacier in a fjord, and you usually see marine life too. Whales breaching is not uncommon. Zipline tours in the rain forest. Helicopter flights up on to the ice field (I think there are dogsleds up there too.) Float plane tour to the Taku lodge for a salmon dinner. Salmon fishing charter. Rent sea kayaks for the day paddle around the islands. All of these activities have good websites, and get booked up so go ahead and check ’em ahead of time. Need help? During the day, the Alaska State Museum is (907) 465-2901. Our home number is the phone book under Scott and Ellen Carrlee. In pinch, my cell is (907) two zero nine, fifty three sixty. Shhhh don’t tell anyone! You are currently browsing the Ellen Carrlee Conservation blog archives for August, 2009.